“This year the theme of the St. Louis PrideFest parade was ‘Community Proud 2017,’” said Shelley Price-Williams, PhD, SIUE Safe Zone staff co-chair and coordinator of student services and transitions in the SIUE School of Business. SIUE Safe Zone faculty co-chair is Mary Sue Love, PhD, associate professor in the Department of Management and Marketing. “Two of the main charges of the SIUE Safe Zone committee are advocacy for our community members and ally training,” Price-Williams added. “Participation in PrideFest helps us support our SIUE community and surrounding Metro East area, and gives us an opportunity to fulfill our mission. It is important for us to be present, knowledgeable and connected. While some University volunteers marched in Sunday’s parade, others manned an SIUE informational booth that included materials about admissions and housing. 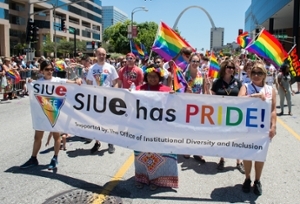 Vicky Dean, assistant director of residential education in University Housing, led participation efforts in 2013 for SIUE Safe Zone’s first St. Louis PrideFest involvement. SIUE’s Safe Zone began in Fall 2000. Its purpose is to provide ally training to members of the University community and to advocate for LGBTQIA members in the SIUE community. Out front and holding the SIUE Safe Zone flag at the St. Louis PrideFest parade are (from left to right): Alumna Vu Do, Jay Davis, University Housing community director in Cougar Village; and Shelley Price-Williams, PhD, SIUE Safe Zone staff co-chair and coordinator of student services and transitions in the SIUE School of Business.